An employment notice entitled CIL Recruitment has been announced by Coal India Limited. Motivated and dynamic candidates will be able to submit their prescribed application form for the 528 publications of the medical officers by the deadline of 28 July 2018. Training criteria: Jobseekers must have a MBBS degree or equivalent from a recognized institute. Visitors must visit the official website to inquire with CIL and it is http://www.coalindia.in. Last date for the online inquiry: 28.07.2018. Check the CIL recruitment here. Coal India Limited (CIL) invites application for the post of 1319 Management Trainees. Apply Online before 24 February 2017. Qualification - B.E./B.Tech/AMIE/ B. Sc.(Engg. )/ICWA/CA/ Graduate/ Post Graduate Degree/ Diploma in relevant discipline with 60% marks. Selection - Selection will be based on Computer Based Online Examination & Personal Interview. Application Fee- General / OBC (NCL) candidates are required to pay application fee of Rs.1000/- through Online by using Debit Card/Credit Card & Net Banking. SC/ST/PH category candidates are exempted from application fee. How to Apply - Interested candidates may apply Online throug website https://www.coalindia.in from 05.01.2017 to 24.02.2017. Coal India Limited (CIL) invites application for the post of 02 General Manager (Legal) in E8 Grade. Apply before 03 February 2017. Graduate with minimum 55% marks with 03/05 year LLB with 55% marks. Selection Process - Selection will be based on Personal Interview. How to Apply Coal India Limited Vacancy - Interested candidates may apply in prescribed Bio-Data format along with copies of certificate of age, qualification, experience, send by only General Manager (Personnel / Recruitment), Coal India Limited, Coal Bhavan, Premises No.-4, MAR Plot No. AF-111, AAA-1A, New Town Rajarhat, Kolkata – 700156 on or before 03.02.2017. 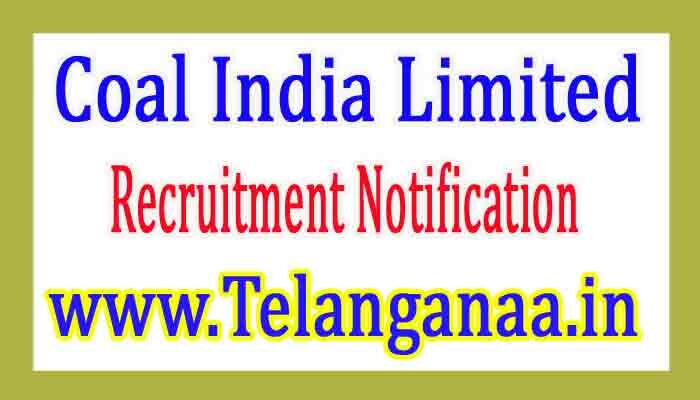 Coal India Limited (CIL) invites application for the post of 06 General Manager (Security) in E8 Grade. Apply before 03 February 2017. Educational Qualification - Graduate and 3 years services as Brigradier or Equivalent in Defence services. How to Apply Coal India Limited Vacancy - Interested candidates may apply in prescribed Bio-Data format along with copies of certificate of age, qualification, experience, challan copy send by only General Manager (Personnel / Recruitment), Coal India Limited, Coal Bhavan, Premises No.-4, MAR Plot No. AF-111, AAA-1A, New Town Rajarhat, Kolkata – 700156 on or before 03.02.2017. Coal India Limited (CIL) invites application for the post of 1319 Management Trainees. Apply Online before 03 February 2017. Educational Qualification - B.E./B.Tech/AMIE/ B. Sc.(Engg. )/ICWA/CA/ Graduate/ Post Graduate Degree/ Diploma in relevant discipline with 60% marks. Application Fee - General / OBC (NCL) candidates are required to pay application fee of Rs.1000/- through Online by using Debit Card/Credit Card & Net Banking. SC/ST/PH category candidates are exempted from application fee. How to Apply Coal India Limited Vacancy - Interested candidates may apply Online throug website https://www.coalindia.in from 05.01.2017 to 03.02.2017.